One of my favorite species of beetles, the Dicranophalus wallichii wallichii beetle is showing in the Small Expressions exhibition being held May 10th-August 12, 2012 at the Long Beach Museum of Art in conjunction with HGA's Convergence® International Fiber Arts Conference, July 15-21, 2012. These two beetles, one male and one female, are flower beetles (Dicranophalus wallichii wallichii) woven in rayon and metallic sewing thread. The title of the piece is Mr. & Mrs. Wallichii. 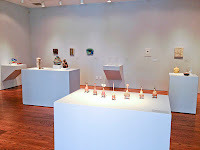 This week I checked out the exhibit at the Long Beach Museum of Art and was extrememly happy with the pieces selected for the exhibit, how it was hung and how my piece looked. Although there were not a lot of pieces in the exhibit, each piece had its own space allowing the viewer to get up and personal with it without being distracted by its neighbors. I always wonder about how my pieces will look in a museum setting since the light in my studios is not the best. Although I have ott lights all over and never weave at night, sometimes it is a surprise to see how much more colorful and bright they are in a different setting. 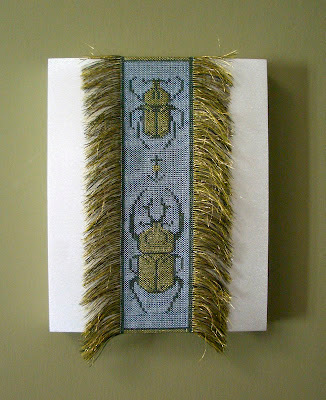 I visited the San Diego Guild on Mother's day weekend to give a talk about my work and the influence of my Mother on my work and again was surprised how much better my beetles looked under better lightening than that in my studio.